Men have an all but incurable propensity to try to prejudge all the great questions which interest them by stamping their prejudices upon their language. The anointed uses innumerable buzzwords [dog whistle words] to (1) preempt issues rather than debate them, (2) set the anointed and the benighted on different moral and intellectual planes, or (3) evade the issue of personal responsibility. When the anointed say that there is a crisis this mean that something must be done—and it must be done simply because the anointed want it done. This word becomes one of many substitutes for evidence or logic. The vocabulary of the anointed also serves to put the anointed and the benighted on different planes. A concern that is important to the anointed is called “a matter of principle,” while a concern that is important to the benighted is called “an emotional issue.” Apparently other people don’t have reasons or principles; all they have are emotions. Often, when the media formally present both sides of an issue, the reasons given by the anointed are “balanced by the emotions expressed by the benighted. Even when “both sides” are presented in the media, seldom are the reasons for each side presented. Another common characteristic of the vocabulary of the anointed is that it puts off-limits the question as to whether what is proposed is in fact achievable. Paradoxically, while feasibility is seldom addressed when proposing public policy, severe limitations on what is feasible by others are often assumed by those with the vision of the anointed and pushed to the point determinism, with a corresponding denial of personal responsibility. Since the bottom line of the prevailing vision is that the anointed are moral surrogates to make decisions for other people, those other people must be seen as incapable of making the right decisions for themselves. The concept of person responsibility is thus anathema to this vision and the vocabulary of the anointed reflects this. What is at stake for the anointed in their discussions of public policy issues is their whole image of themselves as people whose knowledge and wisdom are essential to the diagnosis of social ills and the prescription of “solutions.” to believe that their knowledge and understanding are grossly inadequate for what they are attempting—even if everyone else's knowledge is also grossly inadequate for such ambitious social engineering—would be to bring their whole world crashing down around them. They must believe that they know—and that they know better than others. In addition to particular words and phrases which betray the mindset of those with the prevailing vision, there is a more general tendency toward verbal inflation among the anointed. Thus the ordinary vicissitudes of life become “traumas.” Any situation which they wish to change becomes a “crisis,” regardless of whether it is any worse than usual or is already getting better on its own. Verbal inflation, like monetary inflation, would have no effect if everyone understood what was happening and could adjust to it immediately. A ten-fold increase in the price level would mean nothing if everyone were free to add a zero to the sums in all contracts, laws, cash on-hand, etc., and did so immediately. Inflation has an economic effect precisely because there is no such instantaneous and total flexibility. What is intellectually interesting about visions are their assumptions and their reasoning, but what is socially crucial is the extent to which they are resistant to evidence. All social theories being imperfect, the harm done by their imperfections depends not only on how far they differ from reality, but also on how readily they adjust to evidence, to come back into line with the facts. One theory may be more plausible, or even more sound, than another, but if it is also more dogmatic, then that can make it far more dangerous than a theory that is not initially as close to the truth but which is more capable of adjusting to feedback from the real world. The prevailing vision of our time—the vision of the anointed—has shown an extraordinary ability to defy evidence. Sowell posits that characteristic patterns have developed among the anointed for dealing with the repeated failures of policies based on their vision. Other patterns have developed for seizing upon statistics in such a way as to buttress the assumptions of the vision, even when the same set of statistics contains numbers that contradict the vision. Finally, there is the phenomenon of honored prophets among the anointed, who continue to be honored as their predictions prevail by vast margins, time and again. STAGE 1. THE “CRISIS”: Some situation exists, whose negative aspects the anointed proposes to eliminate. Such a situation is routinely characterized as a “crisis,” even though all human situations have negative aspects, and even though evidence is seldom asked or given to show how the situation at hand is either uniquely bad or threatening to get worse. Sometimes the situation described as a “crisis” has in fact already been getting better for years. STAGE 2. THE “SOLUTION”: Policies to end the “crisis” are advocated by the anointed, who say that these policies will lead to beneficial result A. Critics say that these policies will lead to detrimental result Z. The anointed dismisses these latter claims as absurd and “simplistic,” if not dishonest. STAGE 4. THE RESPONSE: Those who attribute detrimental result Z to the policies instituted are dismissed as “simplistic” for ignoring the “complexities” involved, as “many factors” went into determining the outcome. The burden of proof is put on the critics to demonstrate to certainly that these policies alone were the only possible cause of the worsening that occurred. No burden of proof whatever is put on those who had so confidently predicted improvement. Indeed, it is often asserted that things would have been even worse, where it not for the wonderful programs that mitigated the inevitable damage from other factors. Sowell declares that the anointed's greatest vision--greatest achievement and greatest danger are the same: that vision has become self-contained and self-justifying—which is to say, independent of empirical evidence. That is what makes it dangerous, not because a particular set of policies may be flawed or counterproductive, but because insulation from evidence virtually guarantees a never-ending supply of policies and practices fatally independent of reality. This self-contained and self-justifying vision has become a badge of honor and proclamation of identity: To affirm it is to be one of us and to oppose it is to be one of them. Moreover, the pervasiveness of the vision of the anointed at all levels of the American educational system ensures future supplies of people indoctrinated with this vision and also convinced that they should “make a difference”--that public policy-making is to be seen as ego gratification from imposing one's vision on other people through the power of government. It's been another Friday in the era of the Trump presidency and Mueller investigation. That's to say there's been no shortage of breaking news. A deal to temporarily end the government shutdown. Trump confidant Roger Stone arrested by the FBI. 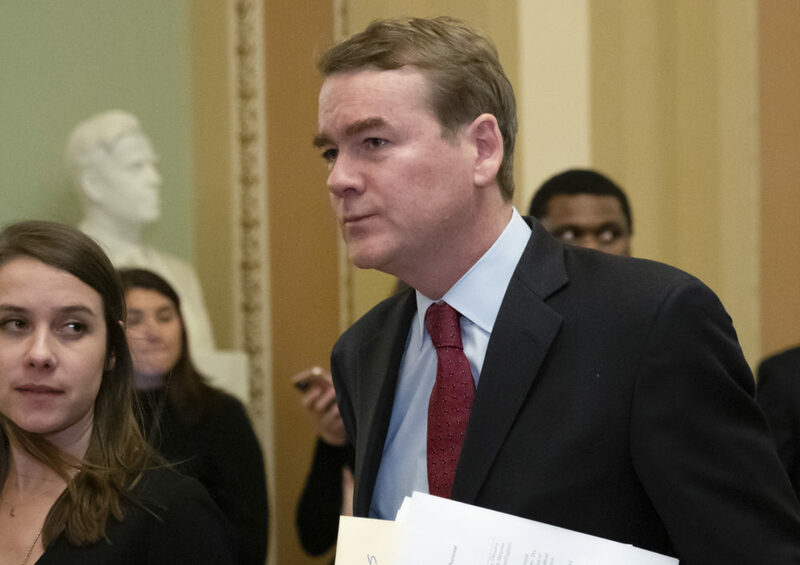 On Point welcomed Sen. Sen. Michael Bennet, D-Colo., who serves on the Senate Intelligence Committee, to discuss. "I can't speak to the specifics on the Intelligence Committee, but I know that everybody is anxious to hear from Michael Cohen in the Senate. I think that my reaction to Roger Stone's arrest is that this is just the latest of over 30 arrests, eight convictions, as a result of the Mueller investigation. That's the largest number, by the way, of any type of special investigation like this that we've ever had. So this idea that the president is trying to get away with, that this is a witch hunt, I think is absolutely, demonstrably false. And finally, I would say, just as an American and also as somebody who once worked at the Justice Department, seeing this footage this morning of the FBI going to Roger Stone's home was a reminder to me that we still are a nation of laws. We're not a nation of men. And most Americans, I think virtually all Americans, subscribe to the rule of law. It's nice to see that process working at a time when the president is so cavalier about our democratic traditions and freedoms." "At this point it's obvious and clear to almost everybody who's observing this that the Russians were working hard to figure out how to elect Donald Trump and defeat Hillary Clinton, and made us vulnerable to their dastardly tactics. And we need to make sure that doesn't happen again in 2020." "I think the truth will come out in the end. I think that there's no number of White House talking points that can overcome the truth. And the fact that the president has defined his wrongdoing as either collusion or the absence of collusion does not ignore the fact that we have a federal criminal code that has all kinds of potential crimes that could have been created in the 2016 election. I mean, I think that at this point it's obvious and clear to almost everybody who's observing this that the Russians were working hard to figure out how to elect Donald Trump and defeat Hillary Clinton, and made us vulnerable to their dastardly tactics. And we need to make sure that doesn't happen again in 2020. And I think in the meantime, all of us Republicans and Democrats together in the Senate, need to do everything we can to defend the Mueller investigation and make sure that he's able to do his job."
. Painful social situations (“problems”) exist not because of inherent limits to knowledge or resources, or inadequacies inherent in human beings, but because other people lack the wisdom or virtue of the anointed.
. Evolved beliefs represent only a “socially constructed” set of notions, not reflections of an underlying reality. Therefore the way by which “problems” can be “solved” is by applying the articulated rationality of the anointed, rather than by relying on evolved traditions or systemic processes growing out of the experiences of the masses.
. Social causation is intentional, rather than systemic, so that condemnation is in order when various features of the human experience are either unhappy or appear anomalous to the anointed.
. Great social or biological dangers can be averted only by the imposition of the vision of the anointed on less enlightened people by the government.
. Opposition to the vision of the anointed is due not to a different reading of complex and inconclusive evidence, but exists because opponents are lacking, either intellectually or morally, or both. Perhaps even more important than the specific tenets of this vision is that these propositions are not treated as hypotheses to be tested but as self-evident axioms. Evidence is seldom asked or given—and evidence to the contrary is often either ignored or answered only by a sneer. Donald Trump is the most dangerous man in the world because he is Emperor of the world. He is the most power leader in the world as President of the United States. But he rules as though he is President of New York City. You can see this in his prejudices. He has decided that he is President of the 42% and the hell with the rest of US. He acts the way he does because the Republicans in Congress are punks. John McCain is a hero even in his grave. Trump is such a coward and punk that he only can pick on dead men and weak women.